What a luxury it was to sleep in this morning until 7-7:30… I know that doesn’t sound like a real sleep in, but when you fall into a deep sleep at 10:30, and hardly move until 7, that’s heaven!!! No one was up at 5:30 whispering with their headlamps on, assuming they weren’t disturbing the 20 other people they shared a room with!!! Just Dan, melodically bringing in the day. We had a leisurely breakfast in the hotel, then after a quick wash out of some clothes, we headed to the cathedral. Just when Dan was feeling worn out, he found a friend in even worse condition! 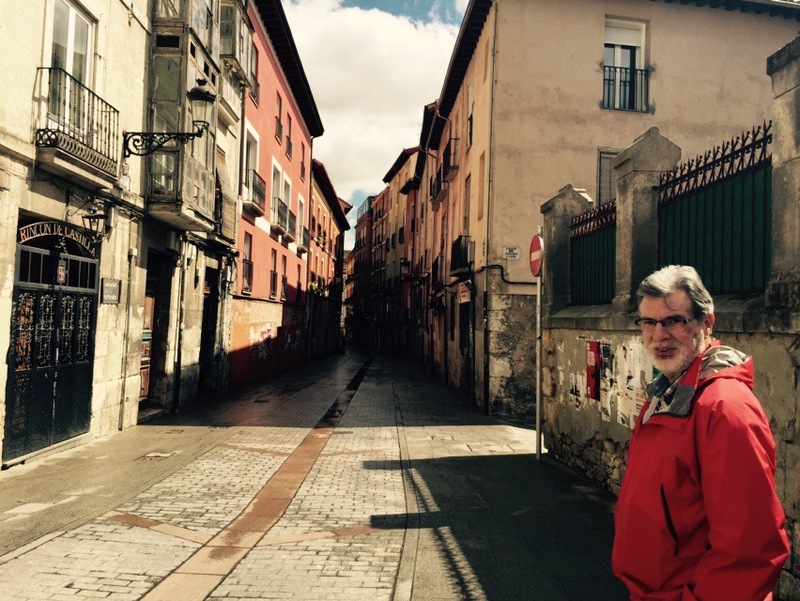 After the cathedral we had a nice walk along the streets of the old city… Found a Farmacia and stocked up on all the essential items for the next week or so, including a wonderful treat of new silicone insoles for our shoes… For tired and injured feet…. I think we qualify!!! After our shopping spree we went for lunch, and then back to the hotel for a siesta… I could really get into this lifestyle!!! 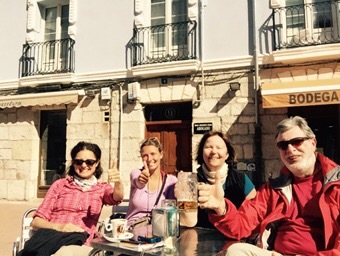 We had contacted Judith earlier in the day, and we decided to get together for drinks at 4. The dream team was reunited, and prepared to take on a cripple!!! Only 21 k tomorrow… Just a walk in the park right??? We’ll see how master Dan does, but it won’t be without great company and support! The girls decided to stay in the municipal Albergue and had a tough night… As it turned out, while they checked in at 6:30 (very late for peregrinas) there was a group of Italian bikers that came in later… There was 10-15 of them, none of whom took showers when they arrived… Decided they could chat to each other until 12-1 am, then… Got up at 5:30 and began rattling and packing and loud whispering until they left at 7:30!!! Dear mild mannered, sweet Judith was fit to kill dead things!!! Again, I’m about ready to kiss Dan’s feet for booking this (comparable) palace!!!! To night the girls have moved to another Albergue… Very strict rules including no drinking, and everyone must take a shower!!! Blessed news to their ears! While sitting there, Stuart wandered by… Now Stuart was my mat mate in Granon, and is from Victoria… Stuart had begun to run out of money a couple of days ago, and there were no bank machines between where we were and Burgos… I was feeling fortunate for Dan’s guardian angel, so decided to give Stuart €50 to tide him over… All he knew was my first name, and where I would be staying in Burgos…I had told him not to worry about it when I gave it to him… If we’d didn’t meet again, I just told him to pay it forward… There would always be someone else needing help!!! Anyway, he saw us all sitting in the plaza infront of our hotel, and popped over to pay out his “loan”… We now have each other’s contact info!!!! 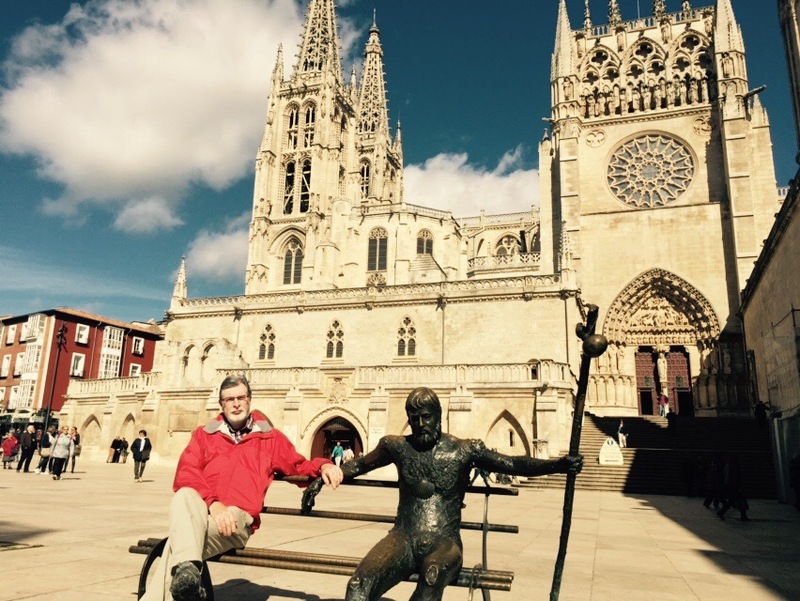 He told me that before he left, a friend who had done the Camino explained that he would meet several angels along the way… He was very skeptical about this, yet already he’s says he has met 2! I know the Dan and I have met our share! Well, we soon started to break up… Stuart was off to buy a larger capacity camera card, the girls off the get some groceries, and Dan and I off to get a little nibble for breakfast… Before parting the girls and we agreed to meet tomorrow am to start our trek… What a privilege it is to be included in their journey! 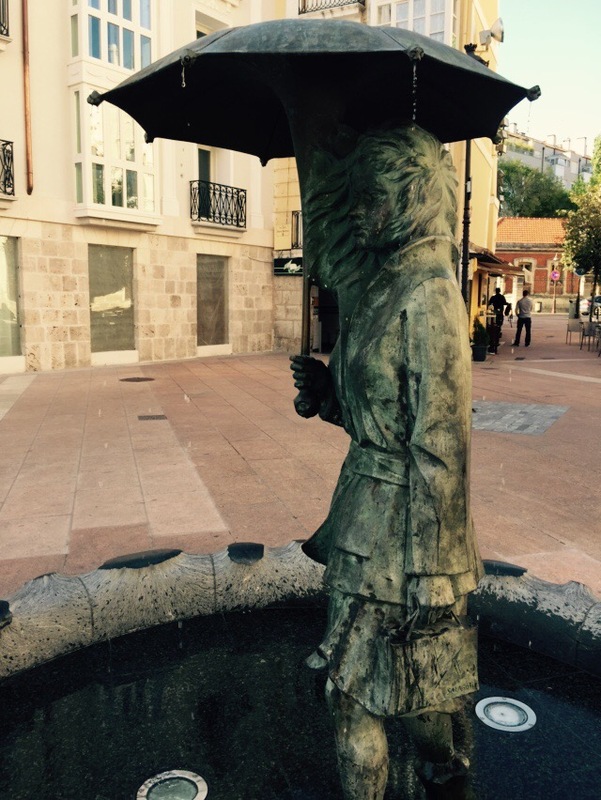 In the way back from our little shop, we came across this awesome fountain… You have to love the creativity of a sculptor that builds a fountain with water falling from an umbrella! Well, back to the room to organize gear, do last minute washing and get ready for dinner ( not a lot of getting ready other than shower!!! Still in hiking gear and no make up, but the restaurants haven’t turned us away yet! We went back to the same place as last night… Another wonderful meal, not too filling, but delicious! And now, to mentally prepare ourselves for backpacks and hiking! Oh, one last night in our own room… Then back to the grind! Thinking of Gjertrud as we passed a newspaper in the lounge ( she’d love to pick up a newspaper, even if she didn’t speak the language), and of course our little Scottish friend… Love and blessing go out to them tonight! I am so glad you had this day to recuperate! I know it must be a joy to reunite with Dan. As to the make up, your face is beautiful without it and you glow with good health. No make up required! By now you can probably translate…Les deseo las bendiciones de Dios y buen provecho por sus caminos. What a grand day and what a grand opportunity to “pay forward” to a fellow traveller. Just like you! Thx Carrie! Lots of miracles happening here!!! Glad to here you two are reunited! Hoping Dan is healed up and you two can brave the rest of the walk hand in hand!! Love to you both! We’re off this morning! Will let you know how we made out! Glad to see Dan is on the mend and that you had a chance to rest as well; safe journeys! Thx so much for your wishes!!! The big guy did 26 km today!!! It was a push, but he’s still walking! Spectacular photos! Glad Dan’s doing better. XXXO!